"Safely store your user names and passwords with this simple utility"
Nowadays, it is common to use several online services, like Facebook, personal email, business email, and so on. each of them require login information, usually a combination of a username and a password. It is highly recommend to use a different password for each service, but remembering all those password can be a serious problem. Fortunately, program like WikCoffer will give you a hand. 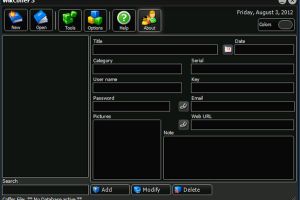 WikCoffer is a simple but powerful utility designed to store login details, serials, and other sensitive information in a safe database. The database will be encrypted and password-protected, so only you -with the correct password- have access to it. WikCoffer features a friendly and intuitive search engine so you can quickly find the information you want, and what is more, you can assign images to your entries. Additionally, the application allows you to drag and drop text from and to other programs.